EVERYONE WANTS TO STAY IN CENTRAL TAVIRA! .............. Large, bright, spacious duplex apartment in private gated development with swimming pool, internet, English TV and Netflix. Open roof top views and outside terraces for eating. Air-conditioned throughout. Three bedrooms (one with a balcony), large bathroom, large kitchen, large living room with French windows. Huge games room/third bedroom upstairs with a small terrace. Good quality table football and large electric air-hockey table. Three minutes walk through cobbled streets to the main square and River Gilao. There’s a wide range of restaurants ranging from smart and sophisticated to local and casual. Tavira boasts a huge indoor market (fresh fruit and veg, meat and fish) three minutes walk away. Several golf courses nearby. Catch a boat to the glorious long sandy beach (life guarded), it has some great cafes and restaurants and is really quiet further along. You don’t need a car. .......................... IF YOU WOULD LIKE TO STAY, PLEASE USE THE 'ENQUIRE NOW' LINK BELOW THE 'BOOK NOW' BUTTON - DON'T WORRY, YOU'LL STILL BE FIRST IN THE QUEUE! (I ADVERTISE IN DIFFERENT PLACES). I WILL ONLY RESPOND TO THE BOOK NOW OPTION IF YOU HAVE ARRANGED IN ADVANCE. Prices - We show prices for at least a year ahead, beyond that, the website forces us to include a default nightly rate of £10. If you are quoted this for your dates, please contact me for the real price. Golf: Tavira is an excellent golf centre, with some quality courses within a short distance e.g. Benamor, Quinta da Ria, Quinta de Cima and Colina Verde. In the evening, you can stroll out of the door and into Tavira's charming restaurants and bars. The Algarve has over 300 days of sunshine a year on average. We have an excellent contact to provide you with very good value green fees e.g. (at the time of writing) Benamor €55 including buggy (reduced from €80 without buggy). Please ask for more details. The apartment is officially registered for holiday rentals with the local council (Alojamento Local). Originally from Buckinghamshire, I live in London with my partner Kate. I work for a company that publishes academic journals for science, technology and medicine (and the Dummies series of books!). Kate works for the NHS. I actually do something called 'User Experience', which means building websites that are useful and usable. This involves lots of listening to people to find out what they really want and then making sure that the website contains all the right features and that it is easy to use. This is why I love renting out the apartment so much. It's all about talking to people and making sure that the apartment will give them what they are looking for - a pleasant and relaxing place to stay. There's more to it than that though. The interesting thing about building websites is that they don't sit in a bubble. When you use websites, you have lots of things going on around you. And, what you do on the site often has an impact later on (like you now - looking for a place to go on holiday!). So when I build websites, I don't just think about the site, I also think how it is going to help the person in their day to day life. That's the same with renting a holiday home. Going on holiday is a journey, you look for somewhere to go, you make a decision, you pack, you fly there, you have a wonderful holiday and then you return and tell your friends family and colleagues at work about it. I want to make sure that the bit where you stay in a wonderful apartment is brilliant because I really know how important it is in your life. You can Google me easily to find out more about what I do - Ivor Tillier. Kate and I have been going on holiday to Tavira for over 20 years. We always used to stay in an apartment near the castle owned by a lovely lady but unfortunately a few years ago she decided to stop renting so we had no choice but to find something for ourselves. The thing with the castle is that it is a bit of a hike up the hill. Horta Poco do Bispo has such a great central location and so close to the market. Also, we bought it when it was being built had so had a really good insight into the quality of the project. We have really tried to add all of those little touches. Things like a good internet connection, a library of books, a selection of games and DVDs and a good kitchen knife for chefs. Always on hand, we have a lovely local family that look after the apartment for us (and clean it fastidiously!). And, finally, the location, it's central but quiet and it's only three minutes walk to both the huge indoor market and the boat to the beach (the town is on your doorstep). Brand new luxury bathroom. Good quality Debenhams towels (but please bring your own for the beach and pool). High quality fittings and plenty of towel hanging space. We leave food where appropriate e.g. herbs & spices, dried food (e.g. pasta and cereals), coffee & tea etc. Always 2 rolls toilet paper to start. Full range of everything you need to cook including high quality stainless steel saucepans. The UK TV signal is delivered by internet. Other languages may also be available, please ask. From the Master bedroom - lovely place for breakfast to watch the world go by! Bicycles available for hire in the town (Abilio). Beach towels available for an additional fee. Generally open April 1st to September 30th. Please check if this is important. My husband and I spent a month at this apartment. We could not find fault with anything. It was clean, beds and bedding were comfortable and of good quality. The kitchen had everything a keen cook could ask for, with ample pots, pans and utensils. The games room was an added bonus. The outside patio was well positioned for catching the winter sun from 10a.m to 2.30p.m, with a table and a selection of chairs. The t.v and WiFi worked well in accordance with the owner's instructions. Tavira is a wonderful town. We have been many times, but this was our best accommodation yet. It is so central, but in a quiet street. We look forward to returning. It was a pleasure to deal with Ivor, the owner, and he has an excellent local contact to meet and greet. We thoroughly enjoyed our stay in Ivor's apartment in Tavira. Booking was straightforward and Ivor was very responsive at all times and the key handover was similarly prompt and easy. The apartment itself is in a fantastic location, just 5 minutes walk from the centre (and the ferry to Tavira Island, which was still running at the end of October). There are loads of cafes and restaurants right by the apartment and within a half mile radius. We never needed a taxi. The apartment is spacious and well-equipped. The kids enjoyed the air hockey and table football and we all enjoyed the dvd collection. We all appreciated the wifi. Our bed was one of the most comfortable we have ever had in a holiday let. This is my 2nd stay at Ivor's apartment in Tavira. We returned once again because of the location in the centre of Tavira just a 5 minute walk to the many bars and restaurants near the river. The apartment can accommodate 4 golfers staying in separate rooms with ease, the underground secure parking means you can leave the clubs in the car for the following days golf. We arrived in the evening but had arranged for supplies (read beer) to be in the fridge waiting which was an added bonus. The apartment is clean, tidy, nicely furnished and has plenty of space. Ivor, Celia and Ze are on hand for any queries day or night. We are sure to stay here on our next Algarve golf trip or indeed with the family. Thanks again. What can I say this apartment is the best find of our lives. We have just returned from our third holiday in Tavira and it is a magical place with amazing beaches, great fresh food and wine and a lively atmosphere that is perfect for families to enjoy. The pool is perfect for kids and adults alike and the fact the apartments are mainly residential and not touristy means it is quiet most days so a good spot for a post brekkie pre beach dip. Booking with Ivor is simple and straight forward and check in is a breeze even when you arrive off a late flight.and check out is the same. Anyone who likes fun, sand and seclusion wouldn't do better than a holiday in Tavira and Ivor's is the best base to explore from. So much so we have already put in our booking for next year. 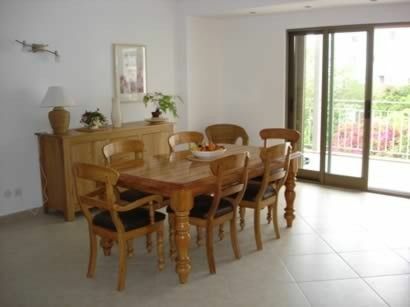 Lovely comfortable Apartment in Central Tavira. This was our 3rd stay in the apartment.So obviously we are very impressed.It is modern ,comfortable &spacious and very central to all of the delights of Tavira.We were dealt with in a professional manner both by Ivor the lovely people who look after the apartment.We will definitely return.Thankyou Ivor! After visiting Tavira numerous times we have found Ivor’s apartment very centrally located, just a short walk from train station. Very easy to get to the beach from the ferry which is a few minutes walk away. So much to do and see in the area, including a lovely visit to Spain. Two good sized bedrooms and family bathroom with large bath. Nice terrace at the front with the sun in the afternoon and a small terrace just enought for 2 in the double bedroom ideal for a sunny breakfast. Ivor was very accomodating and flexible. Tavira 'The jewel of the Algarve' is on your doorstop. Whether you want to wander romantic cobbled streets looking at the 37 churches or soak up the sun on huge expanses of sandy beaches - Tavira is a wonderful place for a holiday. Restaurants range from smart and sophisticated to local and casual. If you’d rather eat in, Tavira boasts a huge indoor market (fresh fruit and veg., meat and fish) three minutes walk away. Otherwise, just sit back and watch the world go by in a one of the pavement cafes. The glorious long sandy beaches stretch for miles. The nearest called 'The island' is reached by a short boat ride (leaves from the town centre in Summer, 20 minutes walk at other times). There are no roads or hotels but there are still some great cafes and restaurants selling the freshest fish you could eat! Tavira makes a great centre for golf holidays. There are several in the area. Nearby Faro is a great town to explore (catch the train) and go shopping. Golf: There are some very good golf courses in the area such as Benamor. In te evening, you can walk out of the apartment and enjoy the restaurants of Tavira. Sorry, here is the small print. Please read this before making a booking. 1. Online booking through this site - Please DO NOT DO THIS without first contacting me via the enquiry form. All enquiries are dealt with in the order they are received. If it is urgent, phone is the best means of contact. Online booking will only be accepted with prior agreement, we may have enquiries pending through our other advertising channels. 2. Our guests almost always pay by online bank transfer which is free or minimal cost (though bank charges may apply outside of UK and Eurozone). You are welcome to use this site's online payment system but see note (1) above and there will be a surcharge to cover their fees and our time to manage the payment. 3. Off peak rates are for two people sharing. Small additional fee for extra persons. 4. Stays of less than a week - Rent will be calculated by first deducting our fixed costs, then working out the nightly rate then adding the fixed costs back on. 5. There is a £160/€200 non-refundable booking deposit. The balance is due 8 weeks before arrival. The balance is part refundable on cancellation: 75% within 55 to 42 days before rental start. 50% within 41 to 28 days before rental start. 25% within 27 to 14 days before rental start. 0% if cancelled less than 14 days before start. In the unlikely event of a cancellation, we always try to re-let the apartment and pass as much rent as possible back to you. 6. We ask that costs incurred for all bank transfers from non Euro or GB Pounds are paid by guests when sending money. 7. Our payment terms take precedence over any suggested by this site. 8. You are strongly advised to contact me before booking flights or incurring any other cost. We are not liable for any travel costs incurred. 9. You will be asked to sign a contract. 10. These conditions are subject to UK law.